It's been a long winter, hasn't it? I'm so ready for flowers, pastels, and all things bright and cheery! 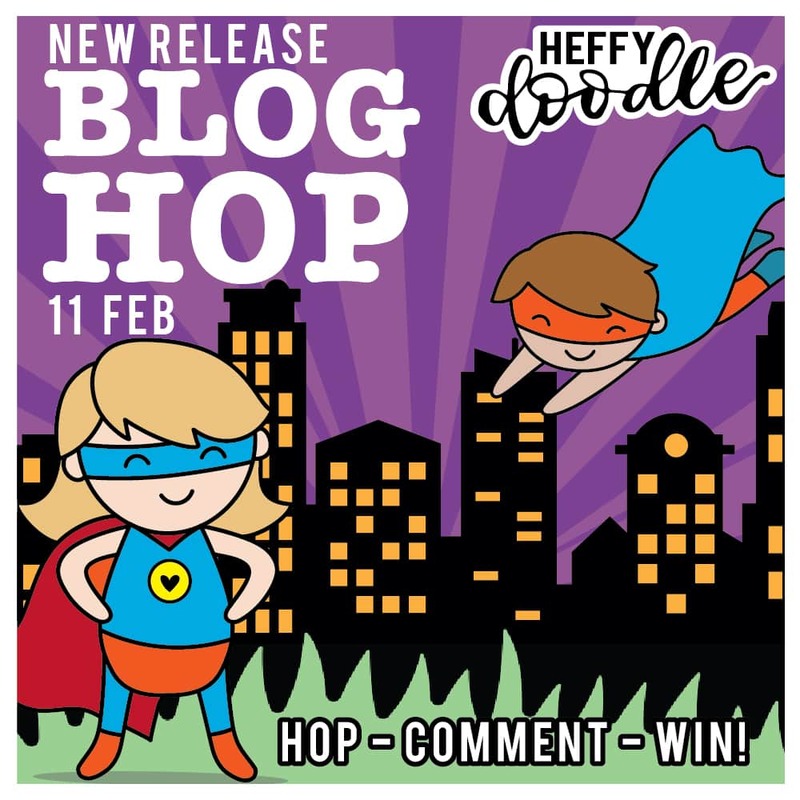 Thanks for joining us in the Heffy Doodle New Release Blog Hop! This release has so many great products for your spring and summer card-making, plus a few really unique things that are sure to round out your collection nicely! Find the entire release here. For today's card, I'm sharing one of the new sets, Big Bug Hugs. So let's get right to the card! You can remember this post for later after you get your goodies and want to create with them! One of my favorite things to do on a card is create ink blended or watercolor window cards. Using the stitched square dies, I cut a window into a 4.25 x 5.5 inch card panel. The negative space is going to be your window, and the square die is going to be the ink blended element. I used Distress Oxide inks and a blending tool to apply various Distress Oxide inks over my square die cut and then set it aside. 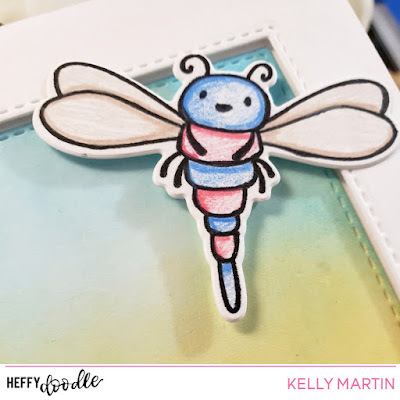 I stamped several images from the Big Bug Hugs stamp set, colored them with Prismacolor pencils, and then used the matching dies to cut them out. After mounting my window panel with foam tape and placing it on to a cut and scored 4.25 x 5.5 inch card base, I laid my ink blended square piece into the window opening and then arranged my die cuts around the window to create a little mini-scene! For the images that were in the window portion and the card panel, I glue the parts that were flat against the panel with liquid glue. For the area that were inside the window, I used foam adhesive to pop them up so that everything would be the same level on the finished card. I die cut the word "friend" from a piece of scrap cardstock I had in my stash and then stamped a sentiment to finish everything off! So let's get to the details of the hop! A random winner will be selected for a £50 gift certificate to the Heffy Doodle store. To be eligible, leave comments across the entire blog hop by 11:59 PM EST on February 18th, 2019. 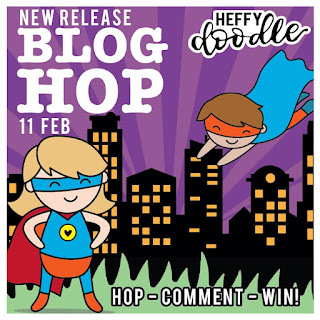 Winners will be announced on the Heffy Doodle Blog on February 20th, 2019. We've also got a special exclusive stamp set to give anyone who places an order before the end of the day on February 11! Those little bugs are so cute! Those little bugs look so good as a whole scene like that :D I LOVE it! Love the pastel look of your card! They are looking super cute ! Aww such a sweet and adorable card! Those bug images are too cute and lovely coloring too! Why do I love snail IMAGES so much, and dislike ACTUAL snails so much? This guy is adorable! So cute! The colors and those little faces are so sweet! 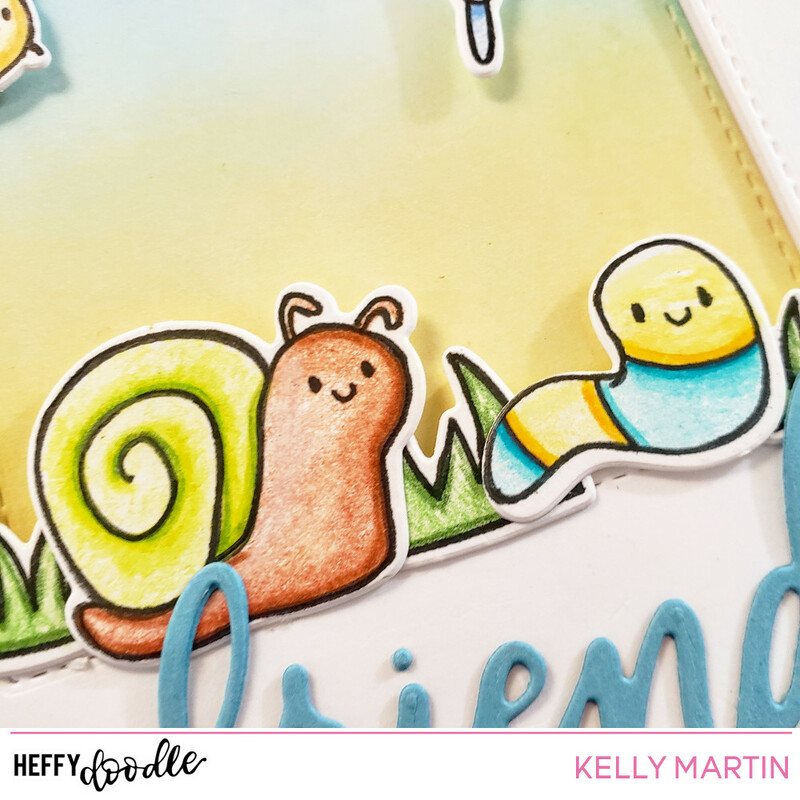 I love the snail, I have been trying to find a cute snail to fill the gap of the saying "snakes and snails and puppy dog tails" I have not found one I like until now. Adorable cards. What a beautiful, friendly card. I like your colouring ! Cute scene. The bugs are adorable. Ahh, bugs and the other sounds of spring! : ) Didn't get cold enough in Florida this year to kill the bugs, so we're in for a bumper crop of 'em this year. lol! I'd MUCH rather have your darling ones!! I'm definitely having the same concern for how mild our winter has been here in South Carolina, too! hahaha! I love how soft your colors are, they blend so well together with these cute images! Cute. I like how you colored these adorable bugs.